Transit should be a great social equalizer. Owning, fueling, maintaining, and insuring a car is expensive. Transit fares are not. Buses and trains should provide good access to jobs, education, and all the stuff of city life for people who can’t afford the costs of cars. In many cities, however, transit’s potential to advance economic fairness is held in check because resources are distributed inequitably. The racial discrimination of redlining is still etched into cities in the form of segregation, household wealth disparities, and public service provision. Unless policy makers intentionally set out to use transit as a tool of social equity, it can just as easily exacerbate longstanding racial and economic disparities. In a new report, TransitCenter lays out six principles for transit agencies to be a force for social inclusion [PDF]. Here’s a summary of the recommendations. When transit agencies cater to well-to-do suburbs at the expense of poorer city neighborhoods, it’s a fundamentally unfair misallocation of resources. And it’s very common. Commuter rail investments like the Long Island Railroad’s $12 billion East Side Access project shift resources away from high-ridership bus and train service to relatively low-ridership peak-hour rail service between office districts and affluent suburbs. The particulars will vary according to the local context, and not every suburban belt is wealthier than the city core. But in many regions, suburban interests are overrepresented in transit agency leadership, skewing policy to favor well-off commuters from bedroom communities. Decisions about major capital investment may also be dictated by property owners or other narrow constituencies whose interests don’t align with providing good transit to people who need it. In New Orleans, for instance, the RTA has prioritized expensive streetcar routes in central, tourist-heavy districts at the expense of bus routes that serve residential neighborhoods, resulting in clear racial disparities. 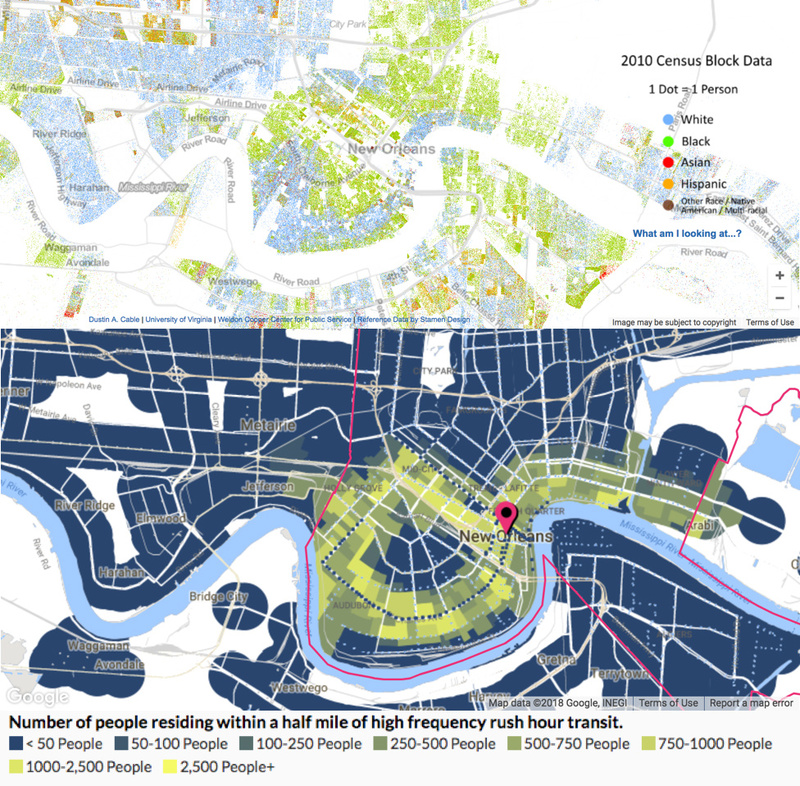 “More than 40 percent of white residents in New Orleans have access to frequent transit at rush hour or better, while only 20 percent of black residents do,” TransitCenter reports. One agency that seems to be getting it right is San Francisco’s Muni, which has set out to improve transit access to jobs, health care, and food for neighborhoods with a large share of low-income residents or people of color. Transit agencies also need to ensure fare structures don’t penalize poor people. TransitCenter recommends funding transit budgets with progressive sources of revenue to the extent possible. Property taxes, for example, are fairer than sales taxes. For transit agencies that do rely on regressive revenue sources like sales tax, it’s all the more important to ensure that service works well for low-income communities. Some American transit agencies are taking the further step of restructuring fares to give lower-income riders a discount. Seattle’s King County Metro, for example, runs a program called ORCA LIFT that offers people earning less than 200 percent of the federal poverty threshold a single-ride fare of $1.50, 40 percent less than the standard $2.50. Portland’s TriMet is launching a similar program this summer. Holding public meetings for the sake of checking off the “public engagement” box is not enough. To reach people who’ve been historically marginalized and may feel skeptical of the process, TransitCenter recommends that agencies team up with existing civic and neighborhood organizations to host meetings. Some agencies have gotten more creative. The Maryland Transit Administration ran an “Info Bus” where staff could meet with riders and explain the redesigned bus system, BaltimoreLink. The Boston Transportation Department hosted a mobile “Ideas on the Street” workshop in 31 neighborhoods to gather feedback for its long-range transportation plan. Sincere public engagement not only incorporates local knowledge to improve transit initiatives by tapping into hyper-local knowledge, TransitCenter says, it also helps increase public support for those improvements. Transit agencies also need to be inclusive in recruitment and hiring. A 2007 review published by the Transportation Research Board found a dearth of women and minorities in transit leadership positions. TransitCenter recommends implementing racial diversity as a hiring criterion, especially for executive roles. Transit agencies don’t control most of the land within walking distance of stops and stations, but they can still use their influence to prevent transit improvements from increasing displacement pressures on vulnerable communities. TransitCenter recommends transit agencies identify where there’s a displacement risk — usually places that were historically redlined. Then, when planning a project, transit agencies should advocate for greater density, lower parking requirements, and below-market rate housing in nearby development. Transit agencies should also resist the tendency to favor large rail-oriented capital projects — which can cause more upward pressure on property values — over bus service improvements. When transit agencies are planning big construction projects, they should hire from local neighborhoods and give preference in contracting to minority- and women-owned businesses. Heavy-handed enforcement of fare evasion can impose excessive punishment on riders. A handful of localities and transit agencies have decriminalized fare evasion, including San Francisco and Cleveland. Decriminalization doesn’t mean that fare evasion is allowed, just that it is treated as a civil offense where the penalty is a fine, not a criminal charge. TransitCenter recommends using transit agency staff rather than police to conduct routine fare enforcement. Having armed police officers on transit can intimidate riders and escalate into dangerous situations. TransitCenter also recommends tracking enforcement data by race and income to guard against bias. It takes money to run a transit system. Two and six are at cross purposes to generating revenue, which, in turn, means less service, not more. Right, but #6 would still imply a civil penalty. Not a criminal one. Traffic fines are civil penalties. Why discriminate against transit riders? You’re using Ferguson, MO, where the law enforcement basically viewed poor people as targets to shakedown (“ticket”) for revenue for the town, as an example? You’re not answering the question – if fare evasion is decriminalized, what motivation does a fare cheat have for showing up to court? 7. Not one penny of sales tax (highly regressive) revenues should be spent on highways or other auto subsidies. For the most part, I agree with these suggestions — not that I’m a transit expert like Angie. I do think East Side Access — if integrated into the bus/subway network with integrated fare zoning, EMUs, high all-day frequency, etc. such that LIRR is a hybrid super-express subway/regional rail will make ESA worthwhile. Many in Eastern Queens and Hempstead will stand to benefit. I also think that in many cities — namely the legacy transit cities but also places like Baltimore, LA, Seattle — railstituting is seen as a capacity/operating efficiencies upgrade such as regional rail, Boston’s Green Line Extension, NYC’s 2nd Ave. Subway, etc. Where rail extensions become problematic is when they neither upgrade capacity nor operating efficiencies or preclude projects of greater transportation value. DC’s H St. Streetcar, DeBlasio’s BQX, Cuomo’s Backwards AirTrain, Boston’s South Coast Rail and South Station Expansion, LIRR’s 3-tracking the Main Line from Floral Park to Hicksville, BART’s Extension to Barryessa, etc. are all examples of negative transportation value projects. Public transit across the US is not for profit. It’s for providing a service and often subsidized. If you ‘re against reducing a fare for someone who does not have the income or any other option to get around because it results in smaller returns then you’re not operating with the correct mindset. It’s providing a basic service of mobility for individuals at an affordable fare. Most transit services are already heavily subsidized, to the tune of 80%+. When a person pays a $2.50 fare, they’re receiving $12.50 in actual value/cost. That other $10.00 is already being picked up by the taxpayers. If you think that public transit should be free, or that the subsidy for all riders should be greater, let’s have that discussion. But, no, just being “poor” should not entitle to you to even more subsidies, a bigger discount than every other rider. The fares are already very “affordable”, and cheaper than any other option, other than biking or walking. Look at any transit system’s operating budget. They receive $X in revenue each year and are able to operate Y hours of service. They have to pay for fuel, tires and maintenance. They have to pay their employees. It’s pretty simple, less revenue = less service. The ONLY way to reduce fares AND maintain (or expand) service is to get more money from the taxpayers! How does the fare cheat get to court? Public transit? Absolutely wrong. People who are willing to work, save, and pay more should have better amenities than those who do not. Areas with high tourist need should have more services than those without the need. Sales taxes are much more fair and broad-based than property taxes as property taxes unfairly targeted homeowners, who are already contributing more to the community. We MUST crackdown on fare evaders; they are thieves who undermine the existence of transit and should be in prison. Poor people should be encouraged to live where they can afford, not to seek subsidies from taxpayers. With a few exceptions (high priced BART, New York City) American transit agencies get much less than half of their operating costs from fares. None of the capital costs are covered by fares. There are places–like San Jose–where fares cover less than 10% of operating costs, and it’s questionable how much the agency is netting above the cost of fare collection. Most transit agencies need fare revenues. But the main revenue issue for most agencies is taxes not fares. I don’t see this as a problem–transit is a public service that deserves public support like non-revenue generating parks, libraries, or schools. Sales taxes are much more fair and broad-based than property taxes as property taxes unfairly targeted homeowners, who are already contributing more to the community. You know renters pay taxes too, its just a pass through in their rent. Local residents should pay some share of the cost of the local transportation system though probably not the majority. A combination of dedicated sales tax, property tax/general revenue, and fares is appropriate. Or they can spend less money subsidizing highways and roadway expansions for cars. In many areas, “they” are two different entities, with two separate budgets. Rarely is it easy to shift funds from one budget to another. In theory, the cost of property taxes and parcel taxes should be passed fully, efficiently, and automatically from homeowners to renters. In practice, this cannot happen at all in some cities (due to rent control and other anti-homeowner laws) and happens only to a degree even in cities with fair laws. A lease is often written for one or two years, so there is a lag in how quickly you can pass on costs to renters. This is why property tax increases often cause foreclosure, bankruptcy, displacement, and economic recession. We really need a nationwide ban on rent control and on limits in the ability of landlords to increase and adjust rents. People that work, save and pay more overwhelmingly do receive more services. Actually, they receive almost all of the services because they have easier access and greater influence with their representatives. Property taxes favor the wealthy and the poor in most cases when it comes a city’s ability to increase revenue (gentrification being the biggest factor that hurts those at the bottom of the income scale). The wealthy can pick-up their phone and call those that determine property tax rates while increasing the tax on those at the bottom it has the possibility of leading to foreclosures. There are very few fare evaders. I am not sure what the penalties are but they must be severe enough that the issue is not rampant. Public transit, is public because it relies on the support from taxpayers. What we really need is a tax on motorized vehicles that could be used for public transit. They take up too much space and sit dormant most of the time. Philadelphia’s infrastructure was built for horse and buggies not for cars and trucks. Lastly, “poor people should be encouraged to live where thy can afford, not seek subsidies from taxpayers”. I will give you the benefit of the doubt and presume you didn’t think this through very well. The poor overwhelmingly live where they can afford to live, as does everyone else, they just have fewer choices. What type of encouragement do you suggest? Plenty of social science studies have shown that the environment (neighborhood setting) you grow up in impacts your happiness and health outcomes, not to much earning potential. No one chooses to be poor (ok, very very few). Hahaha! Why is it wrong? Actually, the third option is to increase efficiency. This may mean cutting some low performing workers, changing routes, using electric vehicles…etc. These are just possible options not necessarily the right options. I do not know how much the state of PA contributes to SEPTA but given the percentage of income tax derived from the economic activity in Philadelphia, it probably is not inline. “FAIR REVENUES, FAIR FARES. Everyone who benefits from transit should pay for the benefits received. Riders benefit and they should pay a fair. The general public benefits (reduced pollution/cleaner air, lower cost of goods in stores due to reduced congestion). So it’s OK for them to pay for that benefit through general taxes. If a city has traffic congestion at rush hour, drivers at rush hour get a significant congestion reduction benefit from transit. People who drive at rush hour should pay a distance-and-congestion-based user fee, both for the benefits they receive and the costs that they impose upon others. (Paying such a fee would induce some drivers to drive off-peak, and this would reduce rush-hour congestion, benefiting drivers.) A portion of the roadway user fee revenue should be allocated to transit. Land value return and recycling (LVRR) techniques would return a greater percentage of transit-created land value to the public sector that created it. This could help make transit (and other infrastructure) financially self-sustaining, at least to a greater degree than today. This would allow for reductions in other taxes — such as the property tax on privately-created building values. Surprisingly, shifting the property tax off of building values and onto land values would make both land and buildings cheaper! Thus, without any additional spending or loss of revenue, both buildings and land could be made more affordable. Additionally, shifting the property tax onto publicly-created land value creates an economic incentive to develop high-value land. This would induce more development of business and housing near existing urban infrastructure amenities (like transit). By increasing infill development and reducing sprawl, transit become more efficient and economical. 3 More employment (including building construction, improvement & maintenance) in transit-accessible locations. the roadway user fee revenue should be allocated to transit. economic incentive to develop high-value land. This would induce more development of business and housing near existing urban infrastructure amenities (like transit). By increasing infill development and reducing sprawl, transit become more efficient and economical. Should Public Transit Agencies Strive for Profitability? Transit is an incredibly affordable way to get around, but for people struggling to make ends meet, fares are still difficult to pay for.